This transcript is brought to you thanks to the hard work of Cheryl Meyers. 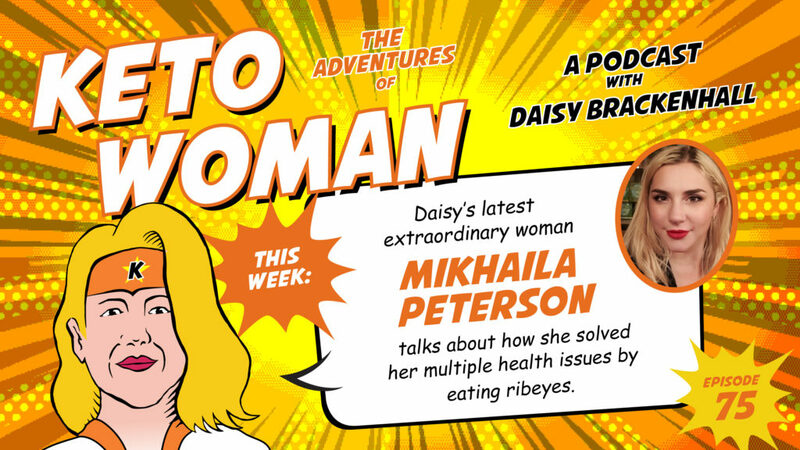 Welcome Mikhaila to the Keto Woman podcast. How are you doing today? I’m doing very well. Thanks for having me. I really enjoyed watching your presentation. Perhaps you could share with the viewers a bit about yourself. Well, we’re at the carnivore conference and I was put up first, which was a little bit nerve-wracking. Yeah. You handled yourself well. Thank you. There were a couple of technical difficulties, but we got through it. Yeah, it was fun. I can’t believe I almost started crying. That never happens. But, so yeah, I think I was nervous, but it was good. I think it adds to it though–adds authenticity. It does, I know. I’ve watched my dad and he does that on stage and I’m like, Ah, dad, come on. It’s real. But like, anyway, that’s never happened before. So it was good though. And there are a lot of people here. Yeah. It’s fabulous, isn’t it though? The first carnivore conference. It’s fun though. It’ll be bigger next year, I think. Absolutely. It’s going to go from strength to strength. Yeah. So tell us about you. You’ve got a fascinating story. I’m 27 and I was super ill since I was two. I had symptoms since I was two, but I was formally diagnosed with juvenile rheumatoid arthritis when I was seven. I was on immune suppressants–Enbrel, methotrexate, naproxin and then, it was just like one thing after another worsening health up to 22 when I started looking at diet. So I was put on SSRIs for really severe depression when I was in grade five. I ended up with chronic fatigue when I was 14 and that wasn’t diagnosed formally until I was 22. When I was 17, even on all the medications I was on, I needed a hip and ankle replacement. So I spent a year on oxycontin getting the hip and ankle replacements done because there’s a waiting list in Canada. So I had to wait for it. And then I had to take an extra year of high school because of all the school I missed. And I eventually went to university and then I started just eating like a university student does, which was just terrible looking back on it. But I was like, I was finally free of my parents and there was like, well, do I want to eat like eggs for breakfast or do I want to survive off of Cinnamon Toast Crunch? I was like, Cinnamon Toast Crunch and Ginger Ale and noodles. And I got, like, my mental health deteriorated really quickly. It was already really bad to begin with, but it got so much worse–just like, the first month of changing my diet that dramatically. And I didn’t know that that’s what it was. So I had just moved out. I was living with a roommate who was a crazy person, probably not as crazy as I was at that time, but he was, I thought, hey, he was my issue because he was just making me so angry. And then I was like in relationships that were upsetting. School was stressful, so I thought it was just from the change. But now looking back on it, I know it was because I was just eating terribly. So for the next two years I kind of continued to eat like that. And I started gaining weight, which had never happened before. And then it started hitting my skin. I started getting rashes and my skin was breaking out and it was kind of like acne, but it wasn’t. And I went to doctors and they tried to figure out if it was bacterial and it wasn’t. And then they suggested it was me just doing it to myself from anxiety. That’s often the fallback, isn’t it? Especially this sort of area of issues, because they’re so hard to pin down. It quite often just gets put on you. Yeah. Well, anything they don’t know. Yeah, for sure. I mean, I was called at one point, I was called a hypochondriac because I got, this was like in my early, early twenties and I started getting really tiny, itchy blisters on my fingers and I was like, this is bad. Hey, this shouldn’t happen to a person. Itchy blisters are a bad sign of something. They’re like, oh no, you’re being a hypochondriac. I was like, what? I physically have blisters on my fingers. This is a bad sign. Um, but yeah, there was a lot of, especially with the chronic fatigue, um, I got a lot of hell and my parents feel bad about it now, especially once I was diagnosed, but for a solid six, seven, I’d say eight years, it was, you know, pull yourself together and get out of bed. And I was like, well maybe everyone just experiences this level of fatigue and they’re just stronger people than me. But then I was diagnosed with idiopathic hypersomnia and put on Adderall. But when I was 22, I decided–this was after going through every doctor I could find to deal with this skin problem. Cause that was the one that was really–like, now that I look back, I know my anxiety was worsening, too, but the skin is what I was obsessing over because it was affecting how people saw me on the outside and everything else before that was kind of invisible. So I had gone through every medical route I could go through and it was getting worse and worse and worse. And so I figured I had to figure out what was going on myself. So, at that point I had moved in back with my parents. I switched schools, I switched programs and went into biomedical science. And it was like, if this takes me 10 years, I’m just going to study and figure out what’s wrong. Seems to be quite a common thread with people who have issues that they’re struggling either to get diagnoses for or to get fixed. They start trying to figure it out themselves. Study when necessary and do whatever they can to just figure it out themselves and find their own solutions. Yeah. Well at a certain point, like if you go, you know, you’re told go to the doctor if something’s wrong and if you go to the doctor and they don’t help you and then you go to like 20 other doctors and none of them help you at some point, you’re like, okay, if I’ve done this the right way 20 times and it hasn’t worked, then I have to do something different. So yeah, I figured that out when I was about 20 and had lost, I had already kind of lost faith in the medical community a number of times. When I was 17, I really, really needed painkillers for the hip and ankle replacement. I couldn’t sleep. The pain was so bad and I couldn’t put my hip in a position that didn’t hurt. That was a pretty young age to have such a big operation. It sounds like your whole childhood was plagued with all sorts of medical interventions. It must have been difficult to deal with. Well, looking back. Yeah it was. But when you’re a kid and you’re sick, it’s not as hard as when you’re an adult and you’re sick. Like it’s just, and looking back, I know I was sick. Like I went to see the rheumatologist. I guess I wanted to see her every six months. I got blood tests monthly, I gave myself injections weekly, multiple injections weekly. And I saw my family doctor probably once a week, I was in the medical system, but it was normal. I had never experienced anything different. And then when I got older it was like, oh, this is annoying. In a lot of ways it was easier as a kid, which is something–like I wrote a blog post about it and it was about, you know if you have a sick kid and how hard is that for a parent and like when we used to go to the rheumatologist, my mum needs to cry every time we went and I’d bring my stuffed animal and she’d hold it and cry and I’d be sitting on the table and be like, yeah, she’s just like poking around in my joints. Yep. That one hurts. That one hurts. That one hurts. But mom would be like crying. I know what you mean–kids are actually pretty resilient and just go with what’s happening without overthinking it, as we do when we get older. Apparently when I was first diagnosed, I was diagnosed and my parents were told rheumatoid arthritis, juvenile rheumatoid arthritis, this means multiple joint replacements at a young age. And I had no idea what that meant at all. And like 30 because they, they suggested the joint replacements would happen when I was around 30–30 when you’re in grade two is like a really old person. So it didn’t bother me. But when you’re an adult and you understand what that means and like how much suffering that actually is, it’s harder. So I didn’t have–I had a hard time as a teenager because my mental health, even with the antidepressants, it was pretty hard–it deteriorated. But it wasn’t really until I grew up more in my twenties that I understood how bad this was and that it was like really starting to kill me. You were saying you were having a lot of pain with it and you needed to get painkillers. With the hip and ankle replacement? Yeah. The first time I really lost faith in the medical community was, I stopped being able to sleep because of the hip pain. And I was on the waiting list for a hip replacement. And I went to my rheumatologist who I’d been seeing since I was in grade two and I said, I need some painkillers, my parents were like, she needs painkillers. And my, grandpa had come and he had been taking Tylenol 3, like daily for back pain and he was like, Oh man, she can’t sleep. So he’d given me Tylenol 3 and I could actually sleep. So we went to the rheumatologists and said, you know, she needs pain medication. And my rheumatologists said, have you tried Ibuprofen? And it was like, I have no cartilage in my hip and I need a hip replacement like yesterday and I can’t sleep. And you’re asking me if I popped an Ibuprofen?? It’s not going to cut it. I tried the Ibuprofen. It just doesn’t do anything. She said she had had a bad experience putting somebody on pain medication, and he hadn’t been able to get off of it very well, so she just didn’t prescribe it anymore. And I was like, that year before that pretty much, well for like at least a six month period I was suicidal with pain. It was so awful. So we ended up going to a walk in clinic and they don’t normally prescribe pain medication and that walk in doctor thank God took me in as a patient and he gave me pain medication. And you have to be a pretty brave doctor to prescribe like the amount of pain medication I needed that year to a 17 year old. And he did it and that probably saved my life. And it was horrible getting off of it because I’d taken it for a whole year, but I did it. So it was fine. But that was the first time I think where I went to a doctor and they were like, you know, we can’t help you. She had referred me to the pain clinic at the Sick Kids hospital [sickkids.ca] and it was an eight week period, waiting time period, to get to the pain clinic. It’s like, what am I supposed to do for eight weeks, not sleep? So that was like the first step. So by the time I was 22, I had been told this was all in my head and enough times, which is shocking considering I had like joints replaced. I had lost a lot of faith in the medical community. So yeah, I decided to start researching myself. So you were at college and you got all these other things that start going on. I know from watching interviews that you’ve done online–I’ve watched on YouTube and things–you started trying to experiment with your diet and how that was going to help. That is because the blood test isn’t very reliable is it? Well, no, the blood tests test for the gene so you can rule it out, but you can’t really say somebody has it. Uh, and I thought, well, I don’t want the, the biopsies have a very high false negative rate because you have to actually biopsy a sample that is diseased. And I was like, I don’t want to do a bunch of biopsies. I’ll just out the gluten and maybe all my problems will go away. That was 2015 and maybe it helped a little bit, but not really. And then yeah, I went on an elimination diet. So it wasn’t actually a Keto diet really. It was like root vegetables without potatoes because I cut out nightshades. I basically just cut out. I came up with this diet and cut out everything that I thought people would be allergic to. So I was eating rice, because I thought everyone can eat rice, everyone can eat meat and fish and everyone can eat root vegetables and apples. That seems pretty safe. That was me not knowing anything about Paleo or Keto or anything. And it, I did it for a week and nothing really obvious happened, and I don’t know why I thought a week was a good cutoff point. But, I tried to reintroduce something and I had gluten free, dairy free, sugar free banana, almond muffins, and two days later my knees were in so much pain I couldn’t walk. So I was in bed for a couple of days after that. And I thought, oh my God, that never happens. I never had flare-ups like that. Oh. And at this point too, when I cut out gluten, I stopped taking my arthritis medication because I was in pain on the medication. Like I was taking Tylenol 3 to sleep because of my shoulder pain and I never really felt it was working. And I had had my joints replaced on the medications. I was like, you know what, in order to give this gluten free thing a real shot, I’m just going to stop the medication. I didn’t tell my rheumatologist, I just quit everything. I was still taking Adderall and an SSRI and birth control and Tylenol 3, but I stopped the arthritis medication. So when I had that flare up, where I couldn’t walk for a couple days, it was pretty abnormal. That hadn’t happened before. So I really dove into diet off for that. And that month, I went down three pants sizes and I lost five pounds, which confused me. And my skin started to heal and my joints were pretty good. But mostly it was like my skin started to heal and I lost, like, mass. I was like, that was bloating? Like what? And then for the next while, and then a couple of months later, my depression lifted, which I hadn’t even thought was possible. I thought, okay, arthritis, skin issues, okay. But no, the depression is like a, that’s a chemical thing and I’m stuck with that forever. My Dad has it, my grandpa has it. That’s not diet related. Yeah, just the way your brain’s wired. Yeah. Right. And, and it had like run in my family, so we’re like, oh, some genetic, like something’s genetically wrong. And that’s just how I’m stuck on this medication forever. And a couple of months into this lower carb than what I’d been doing before, I was still eating rice. But I mean I was eating a lot of meat and a lot of vegetables and a little bit of rice. My depression started to lift and I went off of my antidepressants and when I went of my antidepressants, I went off of all my medication. At the same time as my depression started to lift, my fatigue went away and my itching stopped. So all my symptoms and symptoms I hadn’t even considered were symptoms didn’t take very long. But six months into this diet, well, first I went off of the antidepressants and I stopped eating rice because I noticed rice was upsetting my digestion. I didn’t notice anything other than that just, I was just making me feel overly full. So I stopped the rice and then I started to try to reintroduce foods. And at first I went to what I was craving and missing and what I had been eating before a lot. And I went to soy and I ate so much soy–it was like tofu, miso soup, as much soy as I could eat. And I had like a terrible, it was like 15 minutes and I got bloated and my body was just like, I’m not having any of this. And I was like, okay, no more soy I guess. And then about five hours later, my entire body got itchy and the next morning the depression was back and it was worse than I had ever experienced. And it got worse for about four days and it stuck around for three weeks. And it was so bad that I woke up the next morning and I got into the shower and I just like bawled. How could I be so stupid to think that something as serious as depression was caused by food? How could I be so naive? And then I was like, no, no, it was gone yesterday. Then I had a whole bunch of this and then I like, I had a stomach ache and then I got itchy and now I’m upset. I don’t like upset is putting, putting it very lightly. I was distraught. I was like, it’s definitely, it’s definitely a reaction, but it’s hard when you’re depressed because you just get all those negative thoughts spiraling. It’s like you’ve got two sides isn’t it? You’ve got the emotional stuff is overtaking, but then you had that little logic voice was still strong enough to tell you. It was kind of like–I kept really extensive notes on my phone, so I was just rereading the notes. Like, no, this is the pattern that happened. But for three weeks after that, it got so bad like a couple of days later, so the depression had me crying and it’s just getting worse. I’m like, well maybe it’ll go away in a couple of days. The day after that, so two days after I had soy, I momentarily hallucinated. Ah, I was trying to remember which was the food, it was the soy that did that. That was really scary. That was probably, like the scariest thing that’s ever happened to me. It was like nighttime and I couldn’t, I was doing really badly and I said, Julian, can you drive me back to my –Julian’s my brother–can you drive me back to my apartment? I don’t think I can drive. I’m like, I don’t know what’s going on, but I’m too–I couldn’t see very well, things were very weird. And he dropped me off and I walked to my door and I turned around to wave goodbye. And he looked at me and his face turned into like a demon face and it was long enough that he looked at me and then he looked back and started driving away. And then it was my brother again and I was standing at my door and I was like, okay. So I’m looking in my purse hoping, like, I hope my keys are in here. Um, and I went upstairs into my bedroom and I turned on all the lights and I hid under my blankets and I smoked a bunch of weed because I was having like, panicking and it was–I don’t know, I stayed under my blankets all night and then I, I don’t even know what I thought about. The next week my skin broke out. I was itchy for about two weeks. This is a real snowball effect it seems. And you know, you had these symptoms but within a few hours and you must’ve thought, okay, well that’s the extent of it. Then how you to know that all these other things, we’re going to stop knocking out. What did you think at that time? See, I assume you, she’s still got that no logical voice. What was that voice telling you when you got these couple of seconds, when you saw a demon, was there something that was enough to tell you? For sure. Oh, for sure. What did you think? I mean it must’ve been terrible. I thought, okay, I just saw a demon face. It’s like, I hope my keys are in here because I want to go to my bedroom now. And I was walking up the stairs. I was like, that just happened. That just like that wasn’t real and that just happened. And that was it. Like I knew I, I knew it was a hallucination, but it’s like something is wrong was like, now I’m crazy. Whatever I’ve done with Diet has now made me insane. Like, great, now I’m having hallucinations. Um, but I refuse to take my medication again. And it was, it was an SSRI–an SSRI at a high dose. It was like, no, I managed to get rid of it once, which has never happened. I’m going to get back there. I just have to wait. So I just waited. And then over the next week, the depression didn’t lift, but I didn’t hallucinate again. But it was, other things started happening. Like I said, a week later my skin broke out and then my arthritis came back. So that was really delayed–skin breaking out in the arthritis coming back didn’t happen right away. The itching happened right away, my mood happened right away. And then I wrote down my symptoms every day, and just waited and it was like three and a half weeks and it finally started lifting. It started lifting around 18 days after and then at about day 24 was gone again. I was like, oh my God. And then for the next year I just repeated that. So as soon as the depression would go away, I reintroduce something else. And then it would just be just like this. It was a couple of times that were almost as bad as the soy time, but I learned pretty quickly not to introduce like a pile of the bad food. It took me about six months, and at six months after that I was only having a teaspoon of it and about eight months I was having less than a teaspoon when I reintroduced things. But it took a long time to realize how much really small quantities of things bothered me. So what was your core safe diet at this point? It was sweet potatoes, parsnips, carrots. So like those root vegetables, meats, fish, lettuce, spinach, arugula, apples and pears seemed fine. Turmeric, salt, pepper, and then some other spices. I wasn’t using like curry powders because they had legumes in them. And I had such a bad experience with soy that I wasn’t going to do that again. So it was basically that. It was like–honey as well. It was a very, very limited autoimmune Paleo type diet, which I came across after I found my list of safe foods and I was like, oh, there’s definitely something to this because there’s so much overlap. There were things on the autoimmune Paleo that I couldn’t tolerate, but, ginger was fine too. Yeah, it was a list of 27 foods, but I couldn’t seem to introduce anything over that. And I tried hard for like a year. That’s kind of an obvious question. Why did you bother trying, if you’ve got this group of safe foods, what led you to keep experimenting, to try different foods to see if you could add to that? Just purely because you wanted to increase the variety? You’re a natural experimenter? What made you put yourself through that? Because you were doing it for him as well? Yeah, like there was one point in the summer and he’d probably was still having carb, like a lot of carb cravings so he was like, I’ll eat quinoa, because quinoa’s a health food, and I was like, don’t eat anything that I don’t tell you to eat. And he was eating quinoa and he was eating quinoa all the time and he was doing really badly, really badly. He wasn’t like there when you were talking to him very well and I was like, okay, got to test out the quinoa. So I had like a teaspoon of quinoa and I had a horrible reaction to quinoa. And I was like, you got to get rid of the quinoa. And he can see me when I’m like, when he got sick from these foods, you couldn’t see it as much. Like he does get really pale, but that’s it. Everything else you can’t see. Whereas for me, my skin breaks out and my face got puffy. You could see it happening to me. So yeah, a lot of it was for dad. But by September, so a year, I thought no, no more. And could you limit those reactions? You saying you just tried a tiny little bit. By doing that you could just have a small reaction? Not really. No. I mean, nothing was like–that’s not true. I had a couple that were bad, like soy, but the quinoa was still horrible. Like I got down to, you know, where, like, if I’m stuck like this, I want to die, but I know it will pass. So no, even a small amount seemed really, really problematic. Now I know if it’s a really tiny amount, depending on what it is, then it’ll be okay. The reactions are smaller, but it has to be a really small amount. Even a teaspoon of quinoa was too much. I year after, I thought, I’m not introducing anything for a while because this is exhausting and I can’t keep having arthritis. I don’t want to destroy my joints and I had a great September. Everything was totally fine. Then I tried to reintroduce sauerkraut because I was like, I was still going along the replenish gut microbiome, trying to heal things. So I tried to reintroduce sauerkraut and I had horrible reaction to sauerkraut. And then I got pregnant and I immediately went back to my safe foods and they didn’t work anymore. It was like as soon as I was pregnant they didn’t work anymore. And I was like, oh no. Do you think that was why? It messed around with the balance of it. Yeah. I’ve read a little bit about microbiome changes during pregnancy and it does happen. You get, apparently you get a depletion in the biodiversity and the diversity of your microbiome, so I think that must’ve been what happened. But it happened really fast. It was like as soon as I was pregnant I couldn’t get better. I got itchy again and I was itchy. And then you Google these things and it’s like, oh those are all normal signs of pregnancy. So like okay well maybe pregnancy’s just miserable. I was arthritic again. My face was puffy. Maybe that’s just what being pregnant is like. So I waited, I cut out carbier things. I cut out the apples, I cut out the sweet potatoes, cut out the parsnips because I noticed that would make me feel a little bit worse. So halfway through the pregnancy I was just eating salad and meat and my dad switched to salad and meat too, because he noticed that if he ate a whole bunch of sweet potatoes it would be worse. So then it’s salad and meat. And I was doing vitamin infusions just to make sure I was getting everything I needed, but I was still having symptoms. There is always that fear though, isn’t there, that it is going to go back to being as bad. And you’re just going to be stuck with it again. Going to be stuck with it. And I wasn’t happy. I was depressed but not depressed enough to take medication. But I wasn’t happy and I was like, I used to be happy. I got to a point where I was happy. So how do I get back to that? And I came across Shawn Baker [Instagram], who’s like popularized the Carnivore Diet and decided that day just to go to meat. And I had been putting off going just to meat because I was breastfeeding and because I was getting a lot of hell from my in-laws, mostly. So I’d been putting it off, but I saw his Joe Rogan [YouTube] and thought, okay, I’ll just do that. And a week later, it really didn’t take very long. But um, the itching and the arthritis went away. It’s like a week. And my digestion was just distraught with this new diet. I was having diarrhea, I was getting bloated when I ate and I’d never been bloated doing meat and salad. But now with just meat, I was getting bloated, which didn’t make any sense because I didn’t have a beef sensitivity. I was like, what is happening? So I quit after a week and it was like, this is obviously stupid. And I reintroduced, I had a big salad. And the next morning I woke up and I was weepy and I was itchy and my wrists hurt. And I was like, really? Well, what can you eat then? Yeah, exactly. And like I have to deal with arthritis or diarrhea, can I have nothing? So I just stuck with it and things improved after about six weeks. It took about six weeks and then my digestion improved. A lot of people seem to have those transition issues. Yeah, it’s very normal. Now I know it’s super normal for about two to three weeks. If you’re really sick it can last longer. I think my mom switched over and hers was about four weeks. My Dad switched over eventually he had no transition symptoms. He just dropped salad and then everything improved. So it depends. But it looks like maybe like 60-ish percent of people, um, get diarrhea when they switch over–get bloating cravings. I didn’t really get cravings because I had only dropped salad, so it was a pretty easy transition. But yeah, so I’ve been eating only meat for like 15 months now and I don’t seem to have any symptoms. Yeah, so it fixed it. The whole list of everything and your arthritic pain and everything–all good? All good. All good. I tried to reintroduce about three months into the diet, I tried to reintroduce organic olives–I thought olive oil is pretty safe. And I had quite a few of those over a period of two days. And I had a reaction to them. I was like, if I can’t eat olives–I don’t know why I thought that was the safe one, because of olive oil. If I can’t eat that I’d give up. And then in the last year, there’ve been a couple times I’ve been hit at restaurants just with minute quantities of foods and I do get very minor reactions when that happens. So quantity does matter. You said that in your presentation that it can just be simply from being cooked on a grill that has something on it. It’s going to impact you. Yeah, I had an experience a couple of months ago and I went to a really high end steak house and told them, you know, just the steak, nothing on it, scrubbed the grill and everything. But, at one point I could taste garlic, but I was like, is it in my head or is that garlic? It was very minor amount. I was like, whatever, that’ll probably be, you know, I can barely taste it, it’ll probably be fine. And the next day I couldn’t think at all. Like my head was full of cotton balls, but the depression wasn’t back. It was just severe brain fog and I was bloated like four or five months pregnant, bloated for like a week. My wrists were kind of sore, my skin was a little irritated, but that was the extent of the reaction, which was really scary at the beginning because like I couldn’t think and I was like, oh my God, is the depression going to come back? But it didn’t. But yeah, that was just from whatever was on the grill. So I asked them, what do you usually put on your steak? Because I was like, if there’s, I was worried right about what it could be. And they said, well, usually, it’s olive oil, salt and garlic. And I was like, you know, that’s hardly anything. Right? And they did clean the grill. So yeah, I’m still ridiculously sensitive and trying to figure out how to reduce that. And so what is your diet composed of now? All meat, meat fats. Do you eat fish? You don’t have dairy, do you? No. So it’s not the popularized carnivore diet. That’s eggs, dairy and all meat. I’m just eating ruminant meat. Beef, lamb sometimes, although I don’t really like lamb. High fat beef. I don’t eat lean cuts. I mostly eat ribs. Ribeye, about a pound and a half, I’m like 5’6 [168 cm]. It seems to depend on how tall you are. I eat about a pound and a half, maybe two a day. I eat twice a day and that just kind of naturally happened. Sometimes I eat once a day and I’ll eat more if I eat once a day. But I’m not as good at that. I still get hungry. Yeah. That’s what I’ve been doing for a year. And salt. So beef and lamb and salt and I can do bison and elk. But I started–this is another strange thing that I’ve had a really hard time believing–about a month into the carnivore diet, sometimes I was feeling pretty bad after I ate and I was still eating beef and chicken. And throughout my pregnancy, I’d eaten chicken wings like every day. And for some reason when I switched over to this carnivore diet, I couldn’t tolerate chicken anymore. So I was getting brain fog really quickly, like this weird drunken feeling after I had chicken. Chicken! And I was like chicken’s my favorite, chicken wings. That’s all I want to eat. I like steak but I really like chicken wings and I tested out five times because I was like I can’t be–no one has this from chicken. It’s got to be a coincidence, I’m going to keep trying. Yeah. And I tried turkey and the same thing happened. And the other thing is this weird brain fog drunk feeling? I also got it from sweet potatoes and apples and I was associating it with glucose. Well, why is it happening with chicken? There’s nothing in chicken. So yeah, just beef, bison, ruminant meat. Obviously, you enjoy your food. Do you find it restrictive or is it now just so associated with feeling well, all good? Mostly it’s all good. Like all my cravings went away when I was doing low carb. The problem like, you know, autoimmune Paleo type, low carb, I still had cravings, so I’d still be like, Oh hey, angel food cake. That was like my main craving, Angel food cake. When I went to meat, my cravings went away completely, which is really nice and I don’t overeat ever. I’m just like full and I’ll stop. And I think I was probably still overeating a little bit when I was eating plants and apples and things. It’s definitely, if I could incorporate in other foods, I probably wouldn’t really bother. Maybe like an apple now and then. But I actually like eating this way. It is very simple. Grocery shopping is very easy. Cooking’s really easy. I don’t spend any time cooking. I really like steak. You don’t really get tired of steak. So, no, I like it a lot. The only problem is I’m so sensitive I can’t eat out. So if I could go out to a steak house with everyone and have a steak, then life would be great. But whatever the underlying problem here that’s making me so sensitive–if that could go away and then I could still do this diet, that would be good. That’s the goal is to stick with the diet, but to reduce the sensitivities for when I accidentally get hit. Yeah. And maybe it will, you do it for long enough. Your sensitivities increased, the reactions, increased to certain things, but also with the healing that goes on, that might be that little flexibility that is the goal that you’re after. Yeah. And then the other thing I should mention, which was, has been really interesting, is I was diagnosed with C. difficile. You’ve heard of C. difficile? Yeah. I was diagnosed with that in the fall. And I don’t know how long. I never, so normally you get that if you’re immunosuppressed–it’s like really common in nursing homes, it is common in hospitals, especially for like older immunosuppressed people who’ve been on a lengthy antibiotics. I hadn’t taken antibiotics in years. I’m not immunosuppressed anymore, so I have no idea how it happened. I didn’t have a hospital stay and I’ve treated it now. I went and did microbiome transplants in The Bahamas– that was really recent. So that should be gone but the interesting thing about having a bacterial infection in your gut is it creates gut permeability issues. So I had that tested and I had my gut permeability tested and they looked at something called zonulin, which is the protein that modulates tight junctions in the gut. So it keeps your cells together in the gut. And my zonulin levels are 12 times as high as they should be. So even though I’ve been on this high fat meat diet, which has been shown to basically eliminate leaky gut, my gut is ridiculously leaky. And, I got this tested through my naturopath and he said the clinic had never seen anyone with zonulin levels this high. So I figure maybe I contracted the C diff at some point–I’m not sure when–and maybe the reason I’m so sensitive, like even the garlic on the grill. That’s insane. That’s insane. Right? I could barely taste it. I think maybe part of the reason I’m so sensitive was this infection was increasing my gut permeability to a ridiculous amount to anything I eat. For some reason beef is just that like the safe one and anything else is just like getting into my body. So I’m hoping like what my goals are or what my plan is, is to wait because I just did this microbiome transplant treatment. I’m going to wait a couple of weeks, I’m going to retest my zonulin levels and when my zonulin levels get back to zero, which is where they should be on this diet, I’m going to introduce really small quantities of some sort of plant to see if I can reduce my sensitivity levels. So I’m talking like a pill sized amount of sweet potato, like nothing. I’m hoping that if I do that and give my body a little bit of the plant toxins, it will have some sort of buffer. So if I do get hit with something, I’ll have some sort of–I think it’ll be better. But I have to wait for the zonulin level to go down. You need to have that gut flora to digest things. And that’s part of one of the reasons you get reactions, isn’t it? Because if you, if you’ve been on elimination diet, you just don’t have the flora to deal with things as well. Yeah. Yeah, supposedly. I mean it changes. Like right now I’ll have a carnivorous microbiome, right? So I went and did this microbiome transplant and they’re giving me microbiome from people who can theoretically tolerate a whole bunch of foods. And then I’m on this really limited diet. So they’ll stay, apparently they stay alive for a couple months, but then it’ll go back to being a carnivorous diet. So what I’m doing is I have a number of samples that I took home with me. So I’m waiting. I still need to wait for the zonulin levels to go down before I’m willing to introduce anything. But I’m going to keep giving myself these transplants weekly until my zonulin levels go back down to like zero. And then I’m going to reintroduce. So that’s my plan over the next month and I’m updating people because people are curious to see if you can change. A lot of people go on this all beef diet and then they’re stuck on it. So I’m seeing if there’s a way to become less sensitive, but I have no idea. And if I can’t become less sensitive, I’d still be happy with where I’m at. Yeah. But you’d just like that bit more flexibility if possible. Yeah. Right. And especially my dad, he eats out a lot more than I do and so he kind of gets hit all the time. So he’s never, you know, I’m probably like nine out of 10 feeling and he’s probably seven out of 10, maybe seven and a half because restaurants just can’t cater to something this insanely restrictive, which is understandable. So I’m hoping we can do something to figure out how to make ourselves less sensitive. So again, it’s coming back to that theme of you’re not only doing it for yourself, you are doing it for your dad, and by the sounds of it you’re doing it for other people out there who are in similar situations. So where can people follow you? Find out about what you’re doing? I have a blog, it’s called Don’t Eat That at mikhailapeterson.com. I have a YouTube channel, so same thing–Mikhaila Peterson. Instagram and Mikhaila Peterson. Perfect. Well it’s been wonderful talking to you. Especially face to face. This is a new thing for me, right? With somebody there right in front of me. It’s really good. I’m used to it on a screen too, which is different. Which is good and it’s way past not being able to do it without seeing somebody at all. But it’s a whole different level having you right here in front of me, it’s great. I’m enjoying it. Perhaps you could leave us with a top tip? A top tip? I would say, trust your body–that’s my top tip. And that was really hard for me to learn. And I mentioned that in my talk today, and it was, if you think something’s wrong, you’re probably right. That’s what I realized because I’d reintroduce foods and be like, oh my stomach’s like a bit bloated. Like it’s probably fine. No, listen to your body and if you really listen to your body and practice that and don’t doubt yourself, you can listen to it enough to figure things out as long as you clean up your diet enough to let you get there. Great. Well thank you so much. It’s been a great pleasure.